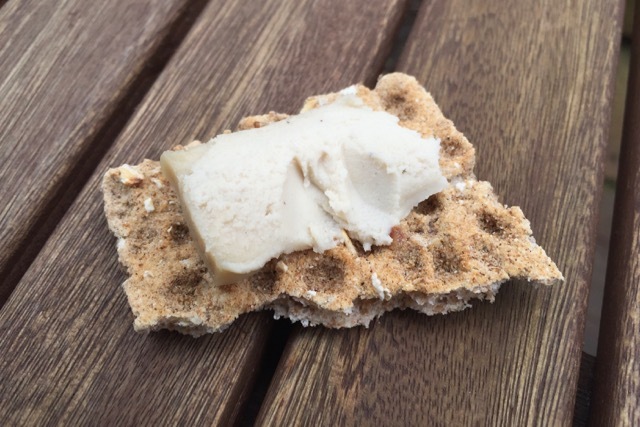 We found the original cheeses had a distinct tofu taste, which is ok in tofu, but less desirable in cashew cheese. 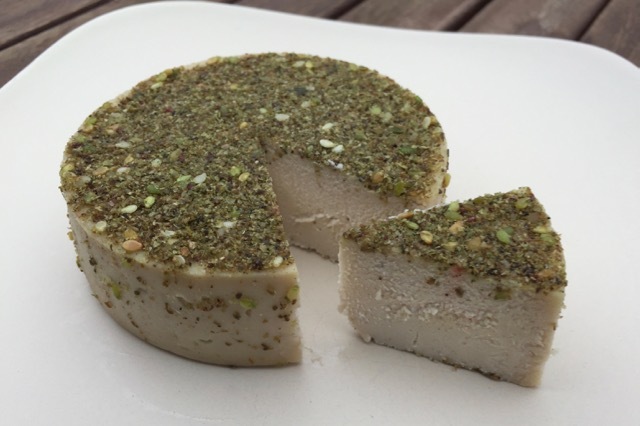 The tofu taste is now gone with these new cheeses. 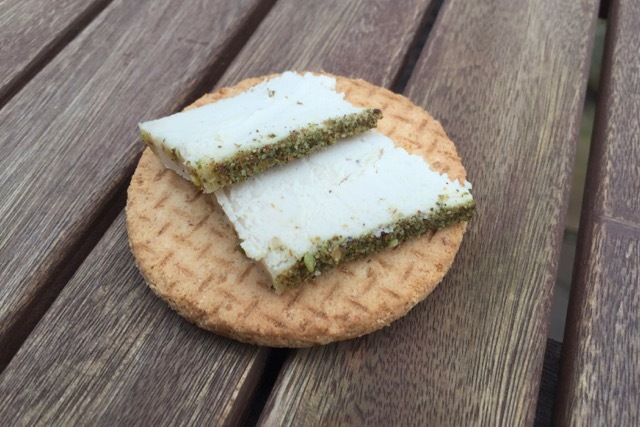 Ami sent us the new version of 'Original', plus the new Za'atar herb crusted cheese, which looks magnificent. You'd be forgiven for thinking we'd replaced the above photo with a stock photo of some brie. The texture is definitely brie-like, with a firm outside yielding to an oozier softer centre. 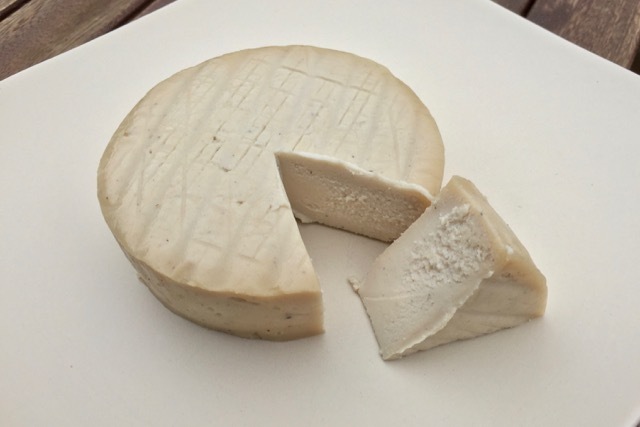 The texture has improved and is now smoother and creamier, while the flavour is a big improvement. The tanginess has been dialled down to a level that will appeal more widely. It's still recognisably Tyne Chease, but better. Spread on a cracker or some crisp bread, the original flavour makes a great snack. The flavour is still strong enough to stand up to being in a sandwich too, especially good with a slice or two of tomato. We did try heating and grilling the cheese, but it had little effect other than warming it. You could bake these cheeses, but they're not really suitable for pizzas etc. The za-atar cheese has a lovely thick crust of herby za-atar (we love za-atar). Surprisingly the herb flavour wasn't that strong once the cheese is sliced, as you only get a herby sliver down one edge. The base cheese in this case was slightly tangier than the original, perhaps being aged for longer. The acidity of the cheese was stronger than the za-atar flavour, while we'd have preferred the reverse to be true. Nonetheless, when served up on a biscuit or cracker it's still a decent cheese. Again this cheese work well in a sandwich. We also put some in a white sauce topping for some baked pasta, where it served well to provide a cheesy crust. 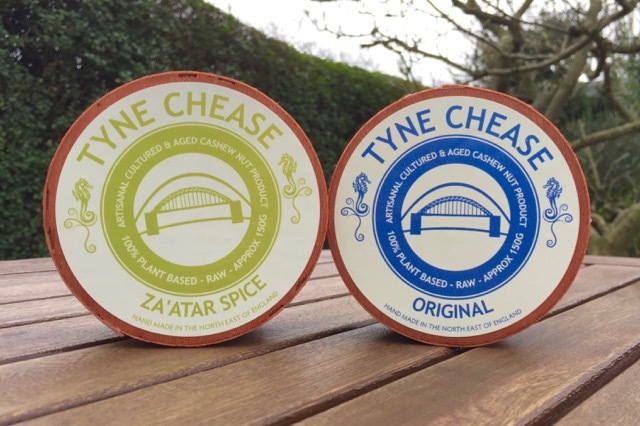 These Tyne Chease products have improved to the point where we can definitely recommend them. Our next review to come is from competitor Nutcrafter Creamery, whose cheeses are very similar, and it's probably a personal preference which brand you might prefer. 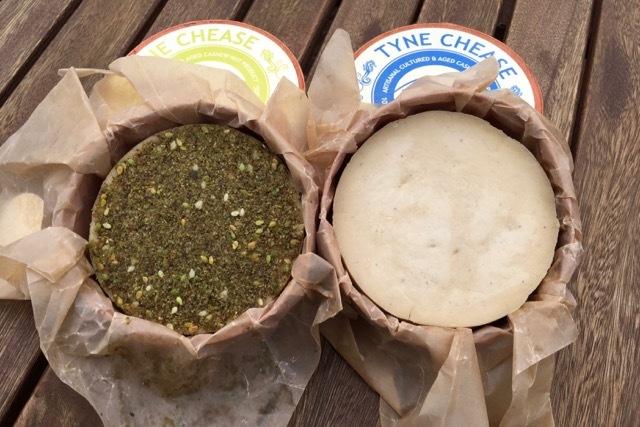 Tyne Chease comes in a wide range of flavours and would make a great vegan cheese board. What we'd really like to see though is a taster box available, perhaps with four quarters of different cheeses, or maybe some mini-wheels. The relatively high price of artisan cheese is putting people off from discovering them if they don't attend VegFest or similar events. 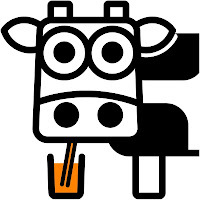 It would be great to showcase these cheeses to wider audience. Ingredients: organic cashew nuts, water, probiotics, himalayan pink salt. Ingredients: organic cashew nuts, water, za’atar spice blend (thyme, sumac, sesame seeds, salt), probiotics, himalayan pink salt. 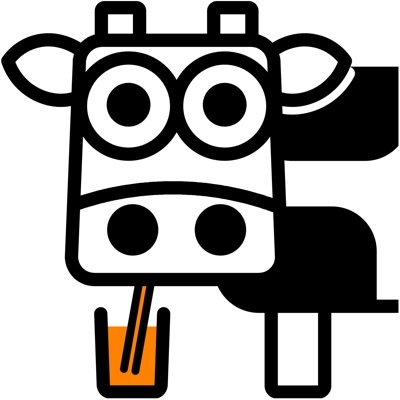 Very good point about the taster boxes, I've been recommending the to my non-vegan dairy-allergy friends, but you're right in that it's a large investment for those that wouldn't find themselves at a vegan festival. Cashew cheese will always be a little mealy. We can see how you'd interpret the lemony tartness for something else too maybe.